Everyone knows the old saying “never argue with the man who buys ink by the barrel.” Well, someone should make an addendum for the folks at AT&T; never try to change the cell service of a man who buys his studio cameras by the pound. 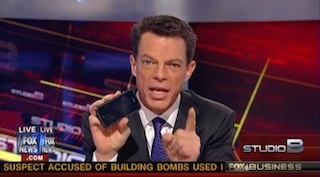 The company has been angering folks for months by attempting to force people out of “unlimited” service plans by, y’know, limiting them and, today, they made the mistake of trying that move on none other than Fox News’ Shepard Smith. Smith could barely let Mashable’s Lance Ulanoff, who was there to explain what was going on, say more than a few words, he was so angry. He compared AT&T’s plan of changing the rules after people had already signed contracts to a crack dealer marking up the price after his customer’s are already hooked. Ouch! Right on, Shep! He’s totally right! We should get the word out about this. Send this clip around! Email it! Watch it with friends! Tweet it! Do everything you can to send it to everyone you know…on your iPhone…which none of us are ever going to stop using…no matter how badly they screw us.